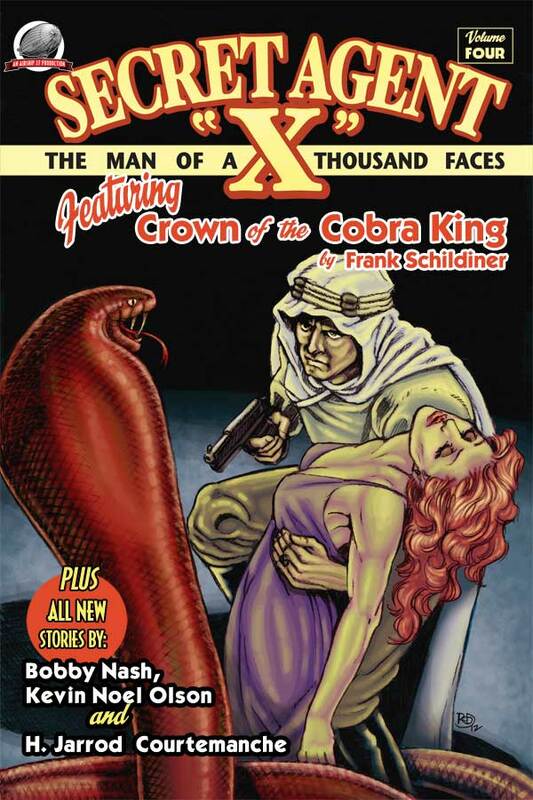 Airship 27 Productions is thrilled to announce the release of the fourth volume in their best selling pulp series; Secret Agent X – Man of a Thousand Faces. The greatest pulp spy of them all, Secret Agent X returns in four brand new adventures. Continuing the excitement and thrills generated by the previous three volumes in this series, the Man of a Thousand Faces is back in four daring adventures written by today’s most talented pulp writers. Deep in mountains of central Europe, Bobby Nash pits X against a deadly beast-man with a special agenda while Jarrod Courtemanche has the master spy confronting a scientist who controls fears. In a one of a kind cross-over, Agent X confronts one of the most nefarious pulp villains of them all, Fantamos, courtesy of Kevin Noel Olson and finally Frank Schildiner chronicles one of our hero’s earliest missions alongside the famed Sir Lawrence of Arabia in the burning sands of the Sahara. “This is by far the most eclectic collection we’ve released thus far,” added Fortier. The book features twelve interior illustrations by Art Director & Company Designer Rob Davis with a terrific cover by Davis and Shane Evans. It is their second artistic collaboration on this highly popular series. Dedicated to the protection of his country, the master of disguises, America’s top secret agent is in wavering his loyalty and courage as he once against takes on villainy in all its myriad forms. He is the one and only Secret Agent X!